Welcome to Syncro Live! This is a brand new feature that will allow you to manage your Syncro devices, well, live! 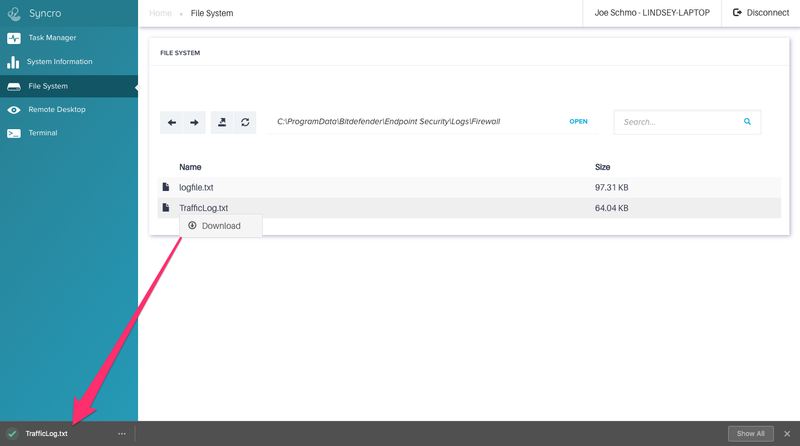 Live currently allows you to remote into a Syncro Device to perform repairs, along with view system specs, edit files and folders in file management, enable powerful tools using scripting, and more! To get a quick demo, check out our video here. To get a more hands on example, you can access Syncro Live by opening up any Syncro Device in your assets and RMM list, and clicking the "Remote Access" button. Upon opening up Syncro Live, you will be presented with the task manager screen. Here, you can view which processes are running, along with the current CPU and RAM usage. Also, you can stop currently running processes, and even start your own! By clicking the "System Information" tab on the left hand side of Syncro Live, you can view everything you need to know about the device's specifications. You can view the current OS, motherboard, CPU, Network configuration, GPUs, and more! The File System section allows you to view the device's folders and their contents. You can also search for files and folders, along with transferring a file into a certain location on the device. 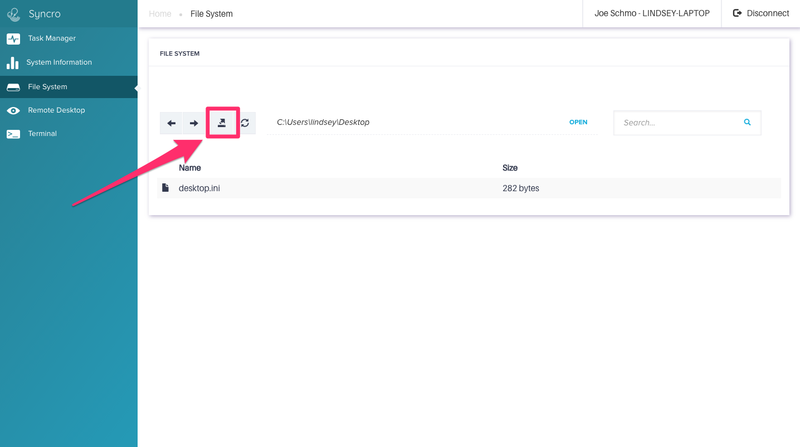 To upload a file onto the device, simply navigate to the desired filepath, then select the upload option highlighted in the screenshot below. This will open up your file explorer for you to select the file you'd like to upload. To download a file from the remote device to your system, simply select the file and the option to download will appear. Remote Desktop allows you to start a remote control session onto the device. The Terminal section will allow you to run scripts live on the device. You can run them with the Command Line, or with Powershell. 1) You must be logged into a Syncro user's account with either "Syncro Live - unattended access" enabled on their security group, or be a Global Admin to use/maintain/create a Live remote session. Logging out of your Syncro account will disconnect you from Syncro Live.